If you grew up in my generation or you know someone who did, then you’re probably familiar with the Razor Scooter. Being seen on a Razor Scooter practically guaranteed instant popularity. The shiny silver body, foamy handlebars, and beautifully opaque wheels topped off by the ultra cool “Razor” printed cleanly atop the sandpapery base was enough to make any kid drop their milk and cookies on the spot. As a fad fanatic, I followed all the Toys R Us trends with devoted attention. Whether it was the Furbee, Giga Pet, Lisa Frank Coloring Book, or the Super Soaker, I had to have it. With the introduction of the Razor Scooter, my eyes grew wide and I begged and pleaded until one day, Great Grandma Harriet made my spontaneous dream come true. My black Razor Scooter and I travelled over 300 circles in my cul-de-sac. But soon I became painfully aware of a grave problem. I was the only kid in my neighborhood, so there was no one I could show off my fancy new set of wheels to. Adults just didn’t get it! Except for one. My dad thought that my Razor Scooter was the coolest thing since the CD-ROM. But since other adults didn’t share his enthusiasm, he couldn’t endanger his reputation by being seen riding that thing anywhere. We were both stuck with dilemmas of our own. I, as most only children do, wanted attention. He wanted to ride the scooter. After much deliberation, we postulated a solution. Every other Monday was “date night” for Dad and me. We’d walk down the hill with our Standard Poodle to Birds, a pub-style restaurant with funky waitresses and a chicken heavy menu. This place was top notch and I looked forward anxiously to my biweekly visit. Birds was a quick twenty-minute walk from my house, but an even faster scooter ride. Here’s how it went down. I’d stand duck-footed on the front of the scooter, holding on to the inside of the handlebars. Dad would stand behind me with one hand holding Muddy’s leash. The three of us would glide swiftly down to Birds after only a few bumpy accidents. Riding down the hill with my dad and my dog gave my performance the extra oomph it needed to be appreciated. The passing adults thought it was hilarious, which I of course loved. Dad got to ride the scooter with the excuse of “making sure I was safe” and Muddy got the exercise he craved after being cooped up all day. Everyone won. From there, the nights would only get better. Our usual waitress would always compliment my “cute” choice of clothing and everyone loved my goofy poodle. I’d order a Wild Berry Juice Squeeze – which was unheard of on any other day of the week – and a Chicken Caesar Wrap. After I’d spread out the remains of my dinner on the plate to create the illusion that I had finished, I would beg Dad for dessert, Peach Crisp to be specific. Only on occasion would he fall victim to my batting eyelashes and the threat of a temper tantrum. But when I was victorious, oh how I was victorious. Served with vanilla ice cream, this warm and crunchy dessert was better than a pound of chocolate birthday cake. Riding up the hill, was of course, not as fun as the trek downward, so dad would usually have to carry my Razor scooter home as I practiced elementary Parkour as a side effect of my sugar high. It was a sad day, last summer, when I waved goodbye to my razor scooter as a friendly neighbor took it off our hands at our garage sale. Thankfully though, I’ve gotten over temper tantrums (for the most part). I haven’t been back to Birds in a while and “date night” usually takes on a different connotation these days. But one thing remains true – Peach Crisp. Even if I hadn’t sold my trusty and rusty Razor Scooter last summer, I don’t think I’d have much interest in riding it down the hill with my dad anymore. But alas, we’ve moved on – to bikes. The Hollywood Farmers Market occurs every Sunday and is an exciting experience for the organically inclined. Tables piled high with figs, eggplants, quince, and more create a colorful scenery and tooth picked samples never fail to tantalize your taste buds. This past Sunday, Dad and I reinvented date night by riding our bikes down (separately this time) to the Farmers Market. A Chicken Satay and Apple Pomegranate Juice later, we took tastes from each and every peach stand at the market. I chose white peaches from one stand and yellows from another. We grabbed some blackberries too and headed home. My rendition of Birds’ Peach Crisp includes blackberries in the mix to give the dessert a more complex flavor. Under a crunchy layer of sweet crumbly oatmeal goodness, you’ll find a moistly ambrosial assortment of summery fruit. This dessert can be made any day of the week, but Mondays have special place in my heart. I’ll be eating the leftovers tonight. 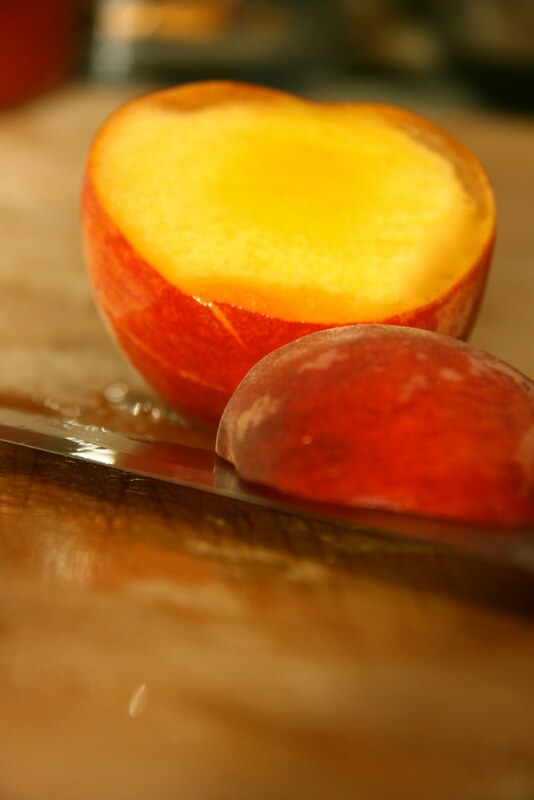 Begin by cutting your peaches into slices a bit smaller than the one’s that were packed in your school lunches (or that you pack for you little ones). Place the peaches and the blackberries in a medium sized bowl. Sprinkle in the brown sugar and a couple shakes of cinnamon. Squeeze the lemon juice over the whole thing. Gently, use your hands to mix everything together. Make sure not to squish the peaches or blackberries. You want to get an even coating of the lemon, cinnamon, and brown sugar. Set the bowl aside to let the fruit soak. In a large bowl, measure all of the ingredients for the topping. With a mixer, blend until the consistency is well proportioned and there are large clumps. Use your fingers to separate the clumps into smaller ones. Butter a nine-inch round pan, or something close to it, and distribute the fruit mixture evenly. Next, crumble the topping over the fruit so that you can barely see what’s beneath. Put it in the oven for 55-60 minutes. When it’s ready, leave it to cool for about 30 minutes. Serve warm with vanilla ice cream for the perfect combination of flavors.